Eyesight is one of our most valuable senses. We enjoy so many privileges through healthy eyesight, amazing sunsets, the faces of our loved ones, reading a dinner menu, driving a car. To keep eyes functioning at optimal levels they need the vitamins, minerals and phytochemicals necessary for them to continually regenerate themselves. Two of the top vegetables for eyesight are carrot and spinach. Carrot not only helps improve eyes and vision, but is good for nearly every body system, including heart disease, lung disorders, cancer prevention, the colon and so much more. Beware of carrot juice though, as you lose the fiber which contains pectin and phytochemicals and reduces the carrot to a sugar laden hit straight to blood sugar levels. Instead use it to cook or blend in a smoothie. Lutein is a carotenoid compound that protects against eye diseases such as degeneration and cataracts. It is found in all green leafy vegetables but is especially high in spinach*. 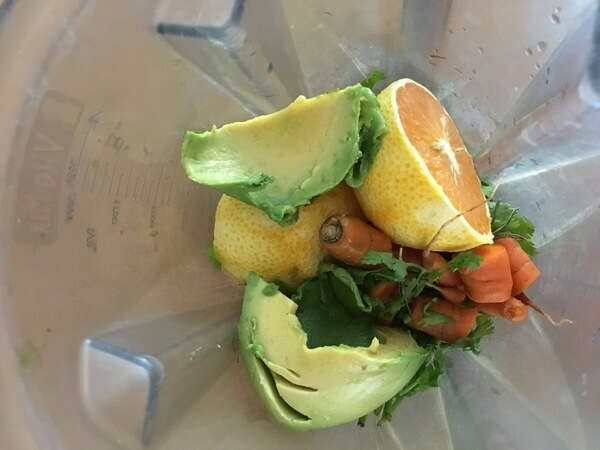 Lutein is fat-soluble which means it cannot be absorbed unless fat is also present, which is why the fat in our next ingredient is so highly welcomed. Avocados are 20% fat. Contrary to popular belief fat is an absolute necessity to a healthy diet, as long as it is healthy fat. Fats constitute 60% of the human brain and are critical for brain health. They also help breakdown important phytochemicals that are fat-soluble such as lutein in spinach. The avocado is also high in glutathione, a potent detoxifier in the liver. The average avocado has 3 grams of soluble fiber and an abundance of omega-9 fatty acids, which are both great for lowing cholesterol. Cilantro is an herb that should be eaten every day for life. It has been used to remove mercury and lead from people suffering from heavy metal poisoning. With the rise of Alzheimer’s and autism, both caused by heavy metal toxicity, cilantro is a must have. I cannot stress enough how important cilantro is in the diet. Add it to all your smoothies, soups, salsas, snack on it raw, enjoy it’s incredible health benefits. Oranges contain a flavonoid called hesperidin. Hesperidin and the pectin in oranges have been shown to lower LDL cholesterol. The concentration of hesperidin is considerably higher in the inner peel, rather than in the flesh. When using orange in my smoothies I use a vegetable peeler to take off the outer skin while leaving as much of the inner peel as possible. Oranges have also been shown to lower high blood pressure, improve immunity and prevent kidney stones. *spinach is highly sprayed with pesticides, make sure your spinach is raw and organic. Also, spinach is high in oxalates, which have been linked with causing kidney stones. If you are prone to kidney stones, supplement spinach with another leafy green such as kale.